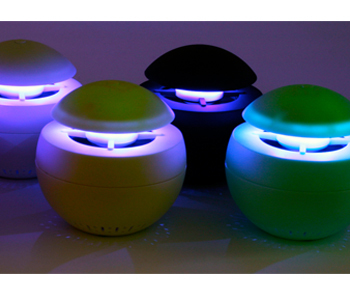 Photocatalytic indoor flying insect trap - Lures household flying insects using white LED lights, where they dehydrate and die. Lures and traps mosquitoes using blue LED UV lights, and soft light waves. Ultra quiet fan,Easy to clean detachable base. Useable as a night light,Included Aromatherapy pads to add your favorite scents for additional use option. Powered via included AC adapter or USB connection,Available in various colors.